I loved visiting my sons in the old house they rented in California. One reason was the towering avocado tree in the back yard. It was loaded with avocados that would fall off the tree, land on the roof with a resounding thud, and then roll into the gutters. I am thinking about them because this is avocado season. Not only are these “alligator pears” delicious in guacamole, their creamy smoothness makes them a flavorful butter substitute. Using them in a recipe is a great way to cut down on sodium in baked goods. You can also use mashed avocado as a substitute for mayonnaise. Avocados are high in potassium, at almost 800 milligrams for a large one; it’s believed that a diet high in potassium helps with blood pressure control. Avocados are fairly high in fiber, with about 10 grams of the 25 or so you need a day. Don’t count on an avocado to be low in calories though. That creamy texture is primarily because of a high fat content. A moderate serving of about 2 tablespoons or a quarter of an avocado is about 50-75 calories. As with everything, moderation is the key. To bring the biggest flavor boost to your table, along with savings on your food budget, choose and eat fruits and veggies when they are in season. 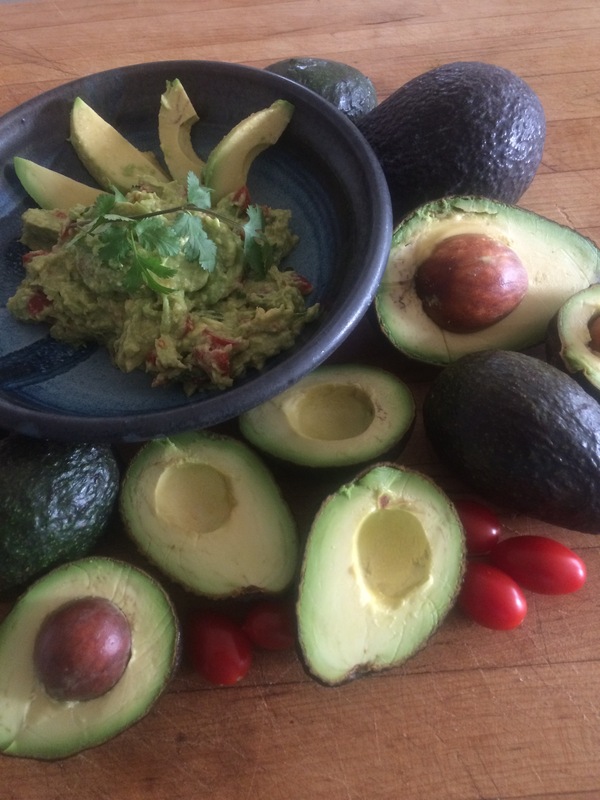 Now is the time for avocados. Crush avocado and lemon juice together with fork. When softened, add sour cream and crush some more. Add the tomato, onion and chili powder, and then stir until evenly distributed. Chill and serve with unsalted or low-salt tortilla chips. Makes 16 servings. Preheat the oven to 350 degrees. Line a loaf pan with parchment paper. Mix egg and vanilla with sugar, and then add avocado and lime juice. Whisk together the flour, baking powder, baking soda and cinnamon. Gently fold avocado mixture and nuts into the flour mix, being careful not to over-mix. Spoon the thick batter into loaf pan and bake for 45 to 50 minutes or until an inserted wooden skewer comes out cleanly with only a few crumbs clinging. Cool completely, slice and enjoy. Makes 9 servings.